Thus far, we have looked at three expressions of religious war along Latin Christendom’s long frontier with the non-Christian world: the crusades to the Holy Land, those in Iberia and those taking place along the Baltic coastline. The final expression or form of religious war, however, was not directed outward against Muslims or pagans, but inward against Christians within Catholic Christendom. The most notable example of an ecclesiastical war waged against a heretical social movement was that waged against the Cathars or Albigensians in the Languedoc region in what is now southwestern France. 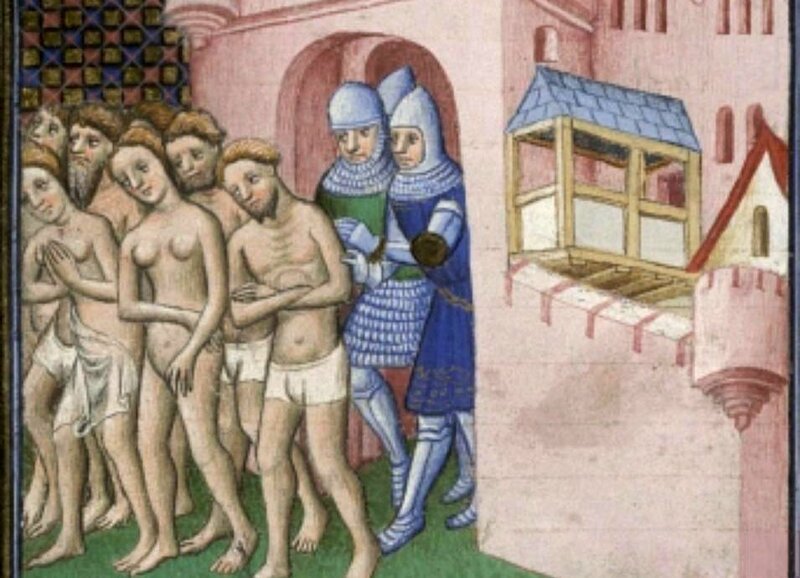 The Cathars were a dualist or Manichean sect which rejected almost every element of Latin dogma, liturgical practice and ecclesiastical structure. By the early thirteenth century, the movement had taken hold in areas such as the Rhineland and northern Italy, but was especially pervasive in the Languedoc where it had found favour not only amongst peasants and burghers, but amongst a number of the region’s more influential nobles as well. The reasons for its popularity in this regions are complex, but crucially important factor was the lack of effective political authority in the region. For centuries, the Church had relied on the secular authorities to create the political context within which the Church could carry out its core mission. This included suppressing unorthodox religious movements when they posed a threat to this mission. For most of the preceding nine hundred years, this had not been a particularly pressing problem as most such movements had comprised little more than individual preachers and a handful of followers. In Languedoc, however, Catharism was an increasingly pervasive and institutionalized mass movement – one that threatened to displace Christianity in throughout the region and so inflict grievous injury on both the Church and the respublica Christiana. It was also viewed as an expression of the kind of collective sinfulness that had contributed to the disasters in the Holy Land in 1187 – that is, as a manifestation of the spiritual disorder plaguing Christendom that God had punished by laying low the crusader principalities. It is perhaps not surprising, then, that the Church turned to the temporal authorities – including both Count Raymond VI of Toulouse, the nominal prince of the region, and King Philip of France – to suppress this movement. It was only when it found these powers unable or unwilling to deal with the Cathar threat that it sought alternative remedies. Catharism had been an issue in the region at least since 1178 when Count Raymond V appealed to the temporal and spiritual authorities for assistance in dealing with the emerging heresy in his domain. The initial response, a Cistercian preaching mission to the region, failed to stem the rising Cathar tide, as did a subsequent military expedition against Roger Trencavel II who was believed to be abetting the heretics. When Innocent III became pope in 1198, he was determined to enforce orthodoxy in the region. Reflecting his own identity as a reform pope, he began his campaign by sending preachers to the region and by taking steps to reform the local Church. When these efforts again failed to yield the hoped-for results, however, Innocent came to the conclusion that he had no option but to suppress Catharism by force. In 1204 he called on Philip of France to come to the aid the Church, promising indulgences to all of the king’s subjects who did their duty to suppress heretical movements. At first, Philip declined to provide the requested aid, largely because he was concerned that King John of England would exploit the opportunity and attempt to recover territories recently lost to France. Innocent repeated his appeal for aid in 1205 and 1207, sweetening the offer by promising all who took the cross the privileges and protections typically associated with a crusade (although none had yet been proclaimed). Philip, however, again declined to act. Frustrated by the failure of the temporal powers to discharge what he perceived to be their duty to aid the Church, Innocent eventually came round to the view that he would have to mobilize his own war-making capabilities to deal with the Cathars. He was able to do nothing militarily, however, until one of his legates, Peter of Castelnau, was murdered in 1208 after excommunicating Raymond VI for failing to take steps to suppress the heresy. Upon hearing of Peter’s death (which he suspected was at Raymond’s hand), Innocent seized the opportunity to mobilize the armed laity of Latin Christendom against the Cathars and those, like Raymond, whom he believed abetted them, by proclaiming a crusade. The response to the call among the nobles of France was “enthusiastic, even fervent” and a large crusader army was quickly dispatched to attack the lands of Raymond Roger Trencavel, Viscount of Béziers and Carcassonne, a suspected Cathar sympathizer. Thus began a brutal two-decades long war in the region – a war that ultimately destroyed the power of the temporal lords who had protected the heretics, leaving the newly created Inquisition a free hand to extinguish Catharism as a threat to Latin Christendom once and for all. The first of these was the development of a distinctive war-making capability on the part of the post-Gregorian Church. The second was the crystallization of a socially constructed identity-interest complex that placed this Church in a structurally antagonistic relationship with a range of other social forces both within and beyond Latin Christendom. The third was the evolution of the social institution of “crusade” – an institution that both legitimized war as an instrument of ecclesiastical statecraft and re-constructed the armed nobility that provided the core of Latin Christendom’s war-fighting capacity as “soldiers of Christ” willing and able to fight on behalf of the Church and its interests. This historical structure did not “cause” the crusades – at least not directly. Rather, it established the essential conditions-of-possibility for each of the specific crusades that took place during the later medieval era. Once it had crystallized, ecclesiastical war became an always-immanent feature of the geopolitical relations of Latin Christendom; once it had passed from the historical scene, crusading – while formally persisting for centuries – became little more than a vestigial remnant of a bygone era, increasingly out of place in the post-medieval world order of Early Modern Europe.